Fregate Island Private has recently joined the Oetker Collection, an inspiring selection of the world’s “Masterpiece Hotels”. Each property is one-of-a-kind, characterized by singularity, beauty and quality – in harmony with nature. Like Fregate Island Private, the distinctive architecture and interiors of these hotels all reflect the heritage of their individual surroundings. In these exclusive settings, Oetker Collection hotels together share the same core value and commitment: To exceed their guest’s expectations. Oetker Collection hoteliers invest great attention to detail in their hotels’ character and charm. Complementing the highest level of services, every hour of every day, with the creation of a strong sense of belonging for their guests. Offering guests and visitors high-touch, rather than high-tech. With their exceptional concepts, beautiful interior design and exquisite environment, Oetker Collection hotels give flight to thoughts and set the spirit free. Where warmth and harmony make their guests feel at home and ease. Valid for travel dates until 21 December 2017. (excluding 22.12.2016 – 15.01.2019, 08.04. – 23.04.2019 and 01.07. – 30.09.2019). This offer is combinable with all other offers (validity subject to applicable travel dates). This offer is valid for each accommodation type. Here is that exclusive escape, a remote island immersed in nature’s beauty with luxury at your fingertips. 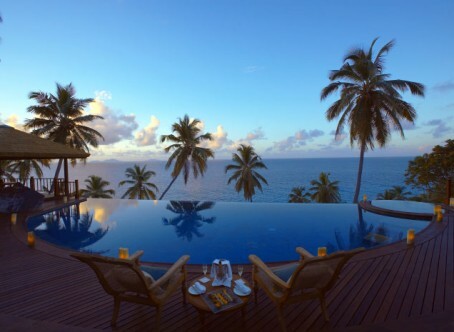 Couples seeking desert island seclusion will adore Fregate Island Private, there’s space, serenity, peaceful sandy shores and a shower of romantic indulgences tailored for two. This offer applies for a minimum stay of 7 nights. For newlyweds this offer is valid within one year following the wedding (excluding 01.07. – 30.09.2017). Offer is combinable with other specials, subject to availability and change. There is always something new to amaze your kids here in nature’s idyllic playground, Fregate Island Private. With 2,200 giant tortoises and just 16 residences, every moment will have the thrill of discovery and the feeling of being a castaway, while on hand is our terrifically engaging conservation team to help the whole family explore and understand the wondrous beauty about them. This offer applies for a minimum stay of 7 nights and is valid until 21 December 2019. (excluding 22.12.2019 – 15.01.2019 and 08.04. – 23.04.2019). Offer is not applicable for a Private Pool Twin Residence or Private Pool Spa Residence, but it can be combined with other special offers. Fregate Island is accessible by sea and air: personalised services for helicopter, plane or boat transfers from Seychelles International Airport on Mahé Island, 5-minute flight to Fregate Island or 1.5-hour boat trip from Mahé Island. A large variety of fresh fish directly from the ocean is available. A selection of fresh, home grown ingredients daily cooked by The Chef Alan Larch offering Créole and international cuisine at its best. In addition to the main restaurant, plantation restaurant, pirate’s bar and beach bar guests may enjoy a meal anywhere, anytime on the island. In the Tree house high up in one of the island’s oldest and largest banyan trees, in the Yacht Club or choose any of the beaches for a BBQ, breakfast, lunch or dinner. A Sunset Cruise or Sashimi Picnic are also offered for a boat excursion. An early evening cocktail can be organized on Mont Signal. Guests can stay in the comfort and privacy of their own residence, where their private butler will take care of all dining arrangements. Rock Spa products will complement the treatments and therapies perfectly. Made in the Seychelles with ingredients grown on Fregate Island, products offer the ultimate in relaxation, revitalisation, detoxification and inner strength. Rates include 15% tax and 10% service charge, private butler, full-board, soft beverages, house wines and local beers. Tax is subject to governmental change. * Rates are only valid upon request and availability. The following children rates apply when more than 2 adults are sharing a Private Pool Residence and more than 4 adults are sharing a Private Pool Twin Residence. Children are included in Banyan Hill Estate rates (see conditions). Each Residence features a lounge, a spacious sun terrace, a large private infinity pool with a Jacuzzi, private butler service, air conditioning, a ceiling fan, free wireless Internet access, personal safe and use of your personal island buggy. The Banyan Hill Estate (1100sqm) features a main living complex and 3 separate residences for a total of 6 persons and up to 3 small children. The main living complex offers a huge open living area with a separate TV lounge and study, a large fully equipped kitchen and a private pool with terrace and pool pavilion. 3 personal electric buggies and wireless LAN are complimentary for the guests during their stay. A personal chef, private butler and personal maid will take care of the guests wishes.